Enter the Name of the project and optionally the description and click Create. The first project configuration is our Common library hosted on a NuGet server. 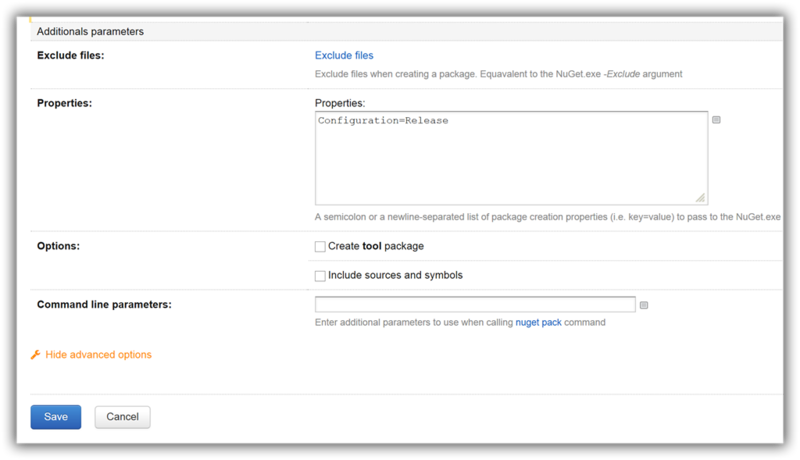 We’ll use the TeamCity NuGet plugin to host our NuGet Common package. Enter the required data and click Create. In the next step we configure the source control. For this set of tutorials I host the project to GitHub in a public repository. As this is a public repository I use Anonymous as authentication method. There are other options you can choose from, like Password or Private Key. Click Test Connection and if everything is ok click Create. 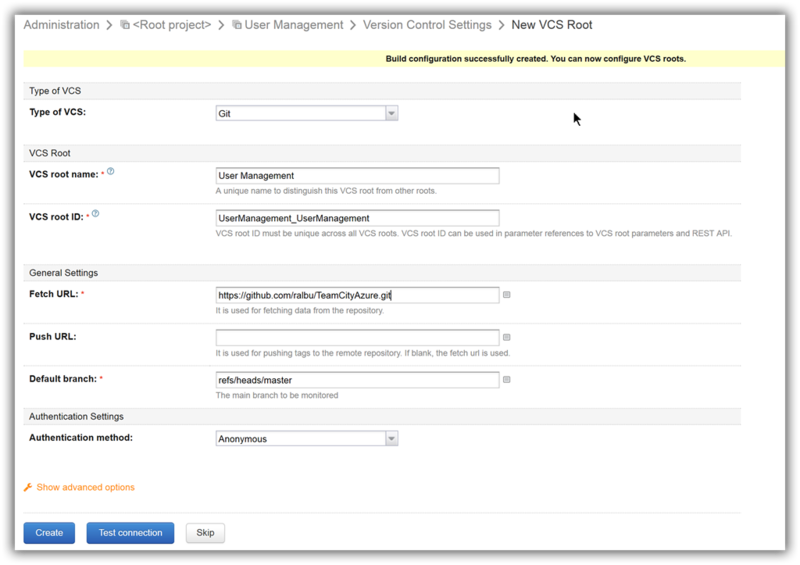 Both projects – NuGet package and Azure Mobile Service used in this set of blog posts are under the same GitHub repository so I will reuse this VCS root in both projects. 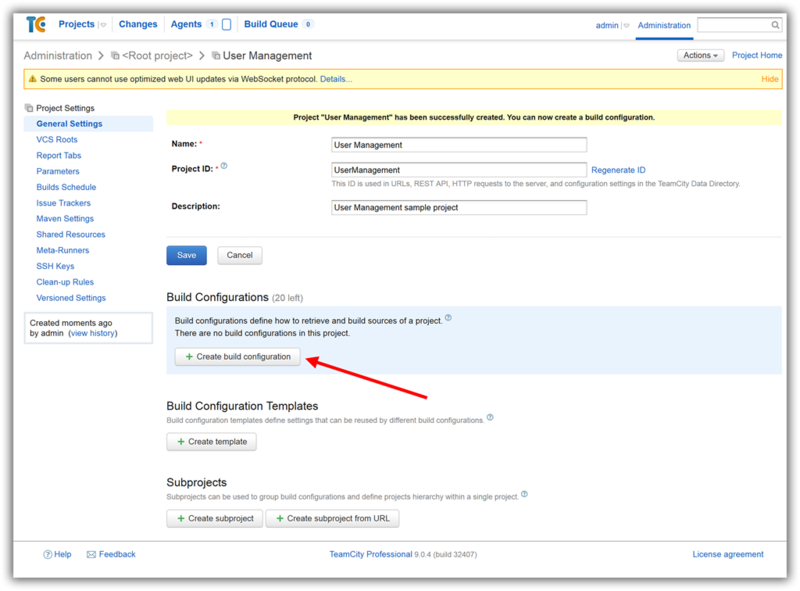 Next we’ll create build configurations but before that we need to install the necessary software and configure NuGet server on TeamCity. We are not going to install Visual Studio on the build machine, although that will be easier. We’ll install only the minimum which is needed to build our projects. Remote into the VM and from https://www.visualstudio.com/en-us/downloads download “Microsoft Build Tools” and install it. You might also need to install “.NET Framework 4.5.1 Developer Pack”. If you want to have a clean machine I would skip this step and install it later if the build fails. I had to install it because of the xUnit framework. If you are not sure you need “.NET Framework 4.5.1 Developer Pack” then first start with “.NET Framework 4.5” installation. You’ll need to restart the TeamCity agent. Open the Services application and search for Team City Build Agent and restart it. Copy the folder C:\Program Files (x86)\MSBuild\Microsoft\VisualStudio\v12.0\WebApplications to the same location of TeamCity server. The reason for doing that is because we don’t have Visual Studio installed on the TeamCity machine. The build process uses targets from Microsoft.WebApplication.targets file to build the Web Application. Copy the folder C:\Program Files (x86)\MSBuild\Microsoft\VisualStudio\v12.0\Web to TeamCity machine. Make sure you copy this folder. These targets are used in generating packages. If you don’t have this targets it will build the solution but it will not create a package which is used in deployment. It is not easy to figure out if you missed it because the solution will build successfully but the package will not be created and it won’t give you any error or warning. In the TeamCity web page, click on the Administration and then in the left hand side under Integration click NuGet. 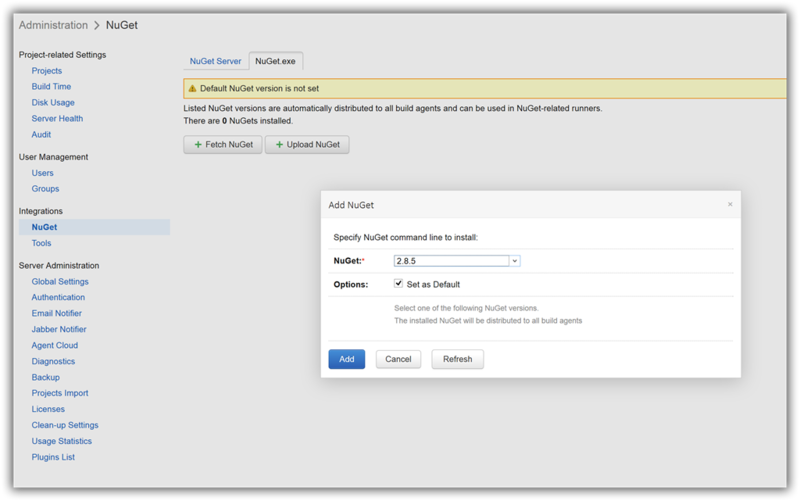 On the NuGet Server tab click Enable button. We are going to use authenticated feed and not the public one. Copy the link to the authenticated feed URL, we’ll use it later. Click on the NuGet.exe tab and then on Fetch NuGet button. 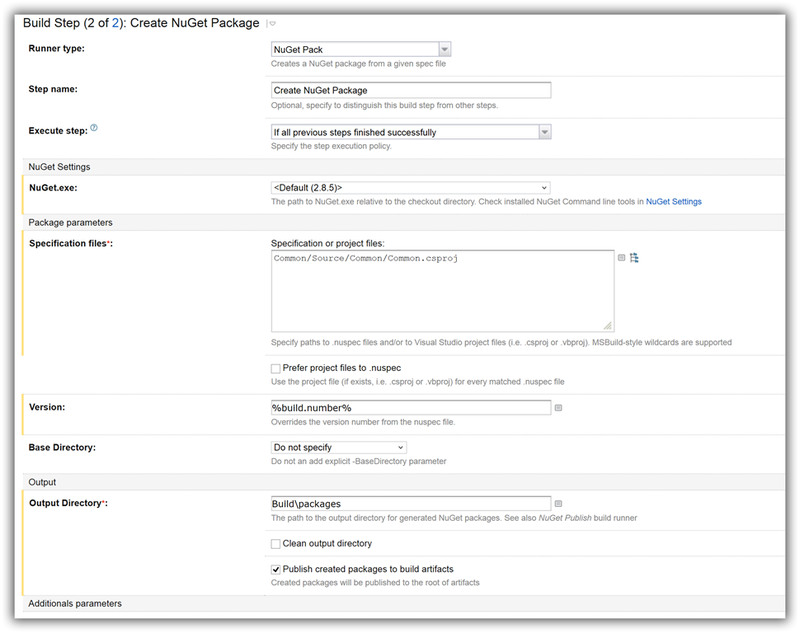 Select the NuGet version and select Set as Default. At the time of this writing the latest NuGet is 2.8.5. In this step we’ll create our first build configuration. As the first step we’ll build our solution. From the New Build Step page select Visual Studio (sln) Runner type and provide the rest of the settings as below and click Save. Click the Run button if you want to make sure that everything is ok at this step. 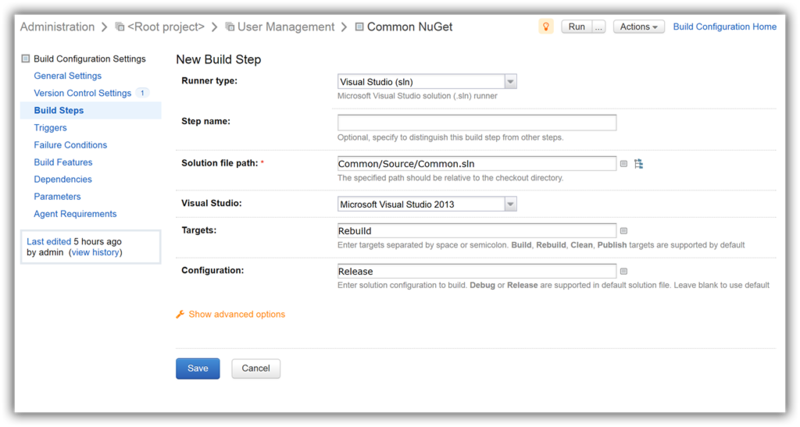 In the next step we’ll add the build configuration to create a NuGet package and publish it on TeamCity’s NuGet server. Open it and adjust it accordingly. I’m not going to go in details about this step, just have a look at the settings below, and if you want to find out more about it then go to my other blog – Hosting NuGet in TeamCity and consume it in Visual Studio where I explained all the settings.